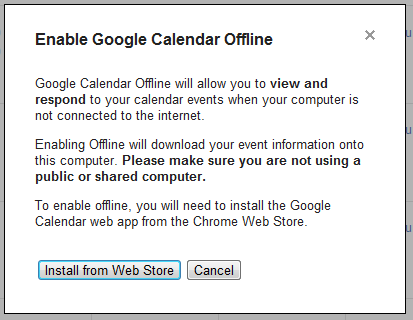 As previously announced, Google Calendar's offline mode started to be rolled out and some of you can already use it. Just like the offline Gmail, Google Calendar only works in Google Chrome and requires to install an app from the Chrome Web Store to enable an advanced permission for "unlimited" local storage (it's not really unlimited, but the app can use a lot more than 5 MB, the default limit). If you click the wrench icon and select "Offline", Google will ask you to install the app. After installing the app, Google starts to save the events from your calendars to you computer. To customize the list of calendars that are available offline, click the wrench icon, select "Offline" and then "Offline settings". When you are offline, most Google Calendar features are disabled, just like in the Gears implementation. You can't create new events, edit the existing events, search your calendars or print your calendars. You can only view some of the events from your calendars and RSVP to existing event invitations. Google Calendar doesn't even save all the events from your calendars. When trying to find older events, Google Calendar showed this message: "Your offline calendar only contains events from Jul 21, 2011 to Jan 5, 2012". Google says that you can only use offline Google Calendar for one account, even if you use multiple sign-in. Google Apps users can try this feature, but only if the admins have switched to the new infrastructure. "To disable your offline access, click the gear icon and select Disable offline calendar from the drop-down menu. This will disable offline access and remove any data stored on your computer." While it's nice that the offline Google Calendar is not a separate app, the offline mode is read-only and doesn't even sync all your events. Google should let you search, create and edit events and add support for other browsers. This is how Offline Gmail should have been. Man Gears edition was so powerful. They removed it, made us wait for so long and gave us a joke! Just so you know, I checked and it looks like GCal's offline mode uses a combination of the WebSQLdb and appcache HTML5 technologies. Appcache is supported in IE9, Firefox and Chrome I believe and allows the app to store essential resources like images and stuff, while the WebSQLdb is _only_ supported by Chrome, and GCal uses it to store preferences, and other essential data. The offline mode would be useless without the DB support, therefore Google can't possibly support any browser besides Chrome. It's not a favoring of their own technology, it's just that Chrome supports more technologies essential to this kind of stuff. WebSQL DB is supported by Chrome, Safari and Opera. Come on, Google, you can do better than that. Oh, and why does it have to be in an App instead of in the normal browser usage? You have to install an app because normal sites can't use more than 5MB of data for local storage. The only way to circumvent this limitation in Chrome is to install an app or an extension. Other browsers allow any site to use unlimited storage or ask users for permission (Firefox). I see why they'd have that limit but... wouldn't it be a better idea to ask the user if this or that website wants to use more than 5 MB of data? That's what Firefox does and it makes sense. Google probably wanted to prevent abuse and restrict this feature to the apps that users trust. It's also a way to encourage developers to add their apps to the Chrome Web Store. I don't think it's a reasonable option, but I haven't seen developers complaining about this. whatever happened to google docs online? also the new interface is a bit jumbled and run-together. Google Calendar default storage size is now "unlimitedstorage". No need to change anymore. 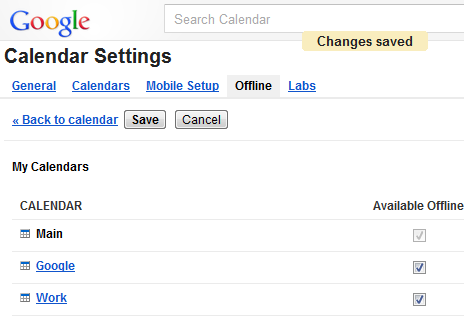 The Google Calender offline feature seems to be no longer available. 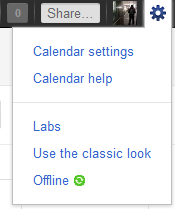 Although there are no official statements about this, the Option "Offline" whithin the Gear-dropdown-menue is missing.